Marriage Celebrants Code Of Practice. Carol's greatest joy in life is writing and this is reflected in her ceremonies. She has spent many happy hours researching different rituals and traditions that she can adapt to the modern day ceremony. Carol is a people person with a great sense of humour. She loves meeting people and at all times she conducts her ceremonies in a relaxed but dignified manner. Carol has been involved in the wedding industry since 1995, assisting her husband Alex in writing and preparation of wedding ceremonies, acting as an usher and generally assisting the bride and groom on their special day. In 2004 Carol, became an Authorised Marriage Celebrant; and has completed a Certificate of Attainment as a Marriage Celebrant as well as a Certificate in Creative Writing. 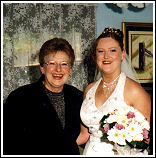 Carol now lives in the Central West near Cowra and she is happy to travel to all areas to perform your ceremony. For many years Carol was a member of the Picton Theatre Group, a member of Campbelltown Toastmasters and a member of the State Emergency Service.